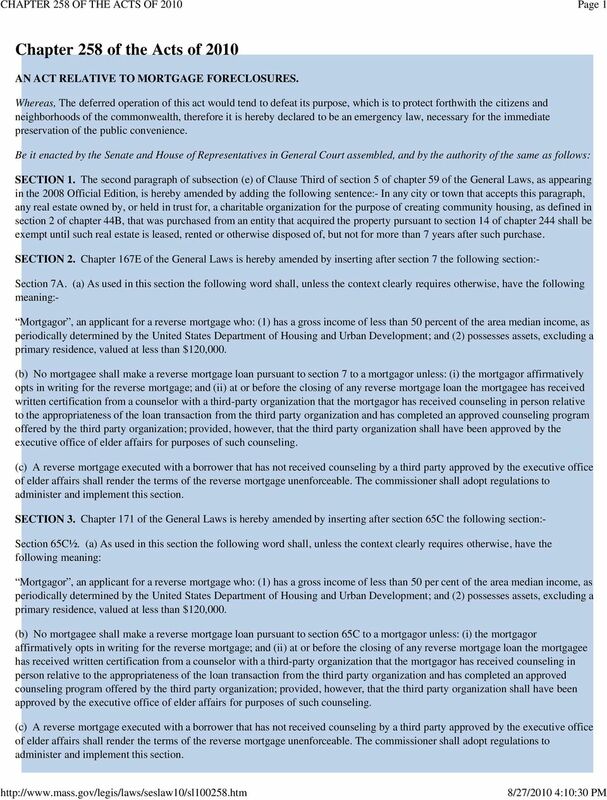 Download "Chapter 258 of the Acts of 2010"
1 Page 1 Chapter 258 of the Acts of 2010 AN ACT RELATIVE TO MORTGAGE FORECLOSURES. Whereas, The deferred operation of this act would tend to defeat its purpose, which is to protect forthwith the citizens and neighborhoods of the commonwealth, therefore it is hereby declared to be an emergency law, necessary for the immediate preservation of the public convenience. Be it enacted by the Senate and House of Representatives in General Court assembled, and by the authority of the same as follows: SECTION 1. 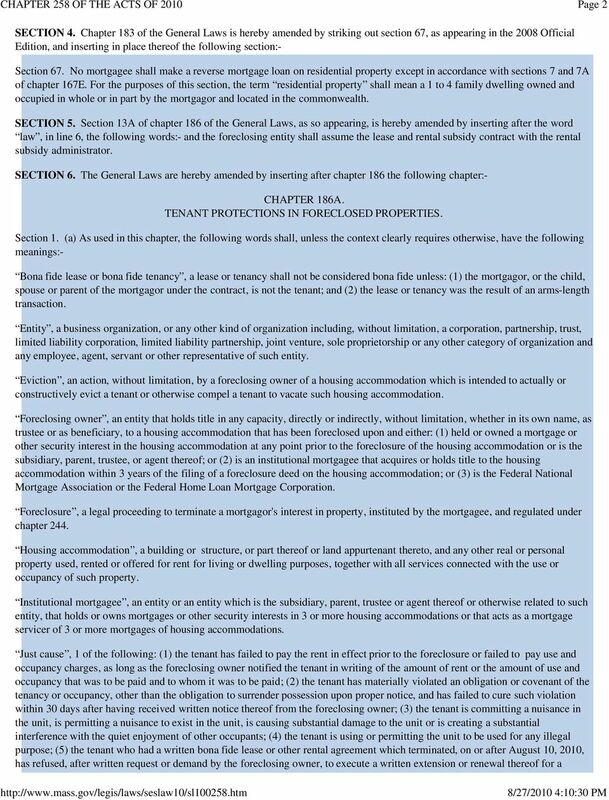 The second paragraph of subsection (e) of Clause Third of section 5 of chapter 59 of the General Laws, as appearing in the 2008 Official Edition, is hereby amended by adding the following sentence:- In any city or town that accepts this paragraph, any real estate owned by, or held in trust for, a charitable organization for the purpose of creating community housing, as defined in section 2 of chapter 44B, that was purchased from an entity that acquired the property pursuant to section 14 of chapter 244 shall be exempt until such real estate is leased, rented or otherwise disposed of, but not for more than 7 years after such purchase. SECTION 2. Chapter 167E of the General Laws is hereby amended by inserting after section 7 the following section:- Section 7A. (a) As used in this section the following word shall, unless the context clearly requires otherwise, have the following meaning:- Mortgagor, an applicant for a reverse mortgage who: (1) has a gross income of less than 50 percent of the area median income, as periodically determined by the United States Department of Housing and Urban Development; and (2) possesses assets, excluding a primary residence, valued at less than $120,000. (b) No mortgagee shall make a reverse mortgage loan pursuant to section 7 to a mortgagor unless: (i) the mortgagor affirmatively opts in writing for the reverse mortgage; and (ii) at or before the closing of any reverse mortgage loan the mortgagee has received written certification from a counselor with a third-party organization that the mortgagor has received counseling in person relative to the appropriateness of the loan transaction from the third party organization and has completed an approved counseling program offered by the third party organization; provided, however, that the third party organization shall have been approved by the executive office of elder affairs for purposes of such counseling. (c) A reverse mortgage executed with a borrower that has not received counseling by a third party approved by the executive office of elder affairs shall render the terms of the reverse mortgage unenforceable. The commissioner shall adopt regulations to administer and implement this section. SECTION 3. Chapter 171 of the General Laws is hereby amended by inserting after section 65C the following section:- Section 65C½. (a) As used in this section the following word shall, unless the context clearly requires otherwise, have the following meaning: Mortgagor, an applicant for a reverse mortgage who: (1) has a gross income of less than 50 per cent of the area median income, as periodically determined by the United States Department of Housing and Urban Development; and (2) possesses assets, excluding a primary residence, valued at less than $120,000. (b) No mortgagee shall make a reverse mortgage loan pursuant to section 65C to a mortgagor unless: (i) the mortgagor affirmatively opts in writing for the reverse mortgage; and (ii) at or before the closing of any reverse mortgage loan the mortgagee has received written certification from a counselor with a third-party organization that the mortgagor has received counseling in person relative to the appropriateness of the loan transaction from the third party organization and has completed an approved counseling program offered by the third party organization; provided, however, that the third party organization shall have been approved by the executive office of elder affairs for purposes of such counseling. (c) A reverse mortgage executed with a borrower that has not received counseling by a third party approved by the executive office of elder affairs shall render the terms of the reverse mortgage unenforceable. The commissioner shall adopt regulations to administer and implement this section. 4 Page 4 the commonwealth or any subdivision thereof, or for the purpose of inspection as permitted or required by agreement or by law or for the purpose of showing the unit to a prospective purchaser or mortgagee provided. Section 5. If a foreclosing owner disagrees with the amount of rent or use and occupancy rates that a tenant-at-will or lessee pays to the foreclosing owner, the foreclosing owner may bring a claim in district or superior court or the housing court to claim that the rent is unreasonable and set a new use and occupancy rate. A bona fide lease between the foreclosed-upon owner and the lessee or proof of rental payment to the foreclosed-upon owner shall be presumed reasonable. Section 6. A foreclosing owner that evicts a tenant in violation of this chapter or any ordinance or by-law adopted pursuant to this chapter, shall be punished by a fine of not less than $5,000. Each such illegal eviction shall constitute a separate offense. The district and superior courts and the housing court shall have jurisdiction over an action arising from a violation of this chapter or of any ordinance or by-law adopted pursuant to this chapter, and shall have jurisdiction in equity to restrain any such violation. It shall be a defense to an eviction proceeding that the foreclosing owner attempted to evict a tenant in violation of this chapter or any ordinance or by-law adopted pursuant to this chapter. SECTION 7. Chapter 244 of the General Laws is hereby amended by striking out section 35A, as appearing in the 2008 Official Edition, and inserting in place thereof the following section:- Section 35A. 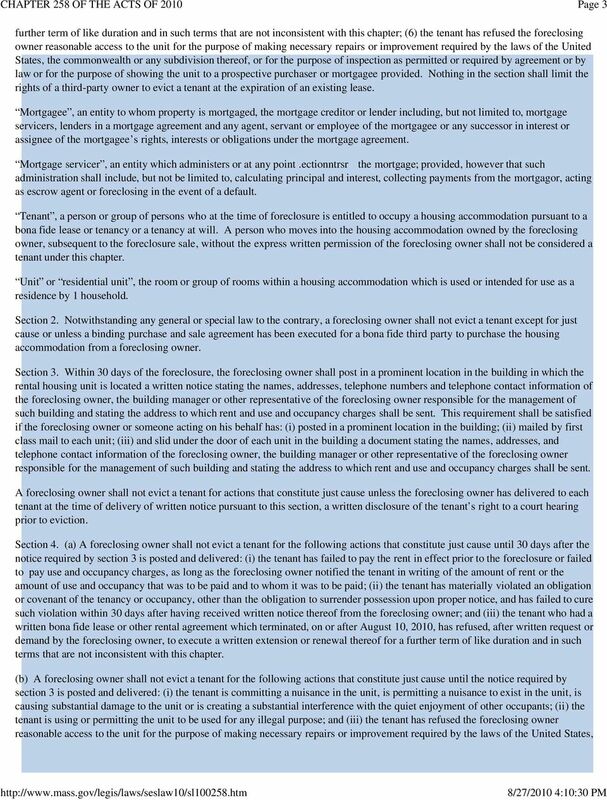 (a) As used in this section, the following words shall, unless the context clearly requires otherwise, have the following meanings: Borrower, a mortgagor of a mortgage loan. Borrower s representative, an employee or contractor of a non-profit organization certified by Housing and Urban Development, an employee or contractor of a foreclosure education center pursuant to section 16 of chapter 206 of the acts of 2007 or an employee or contractor of a counseling agency receiving a Collaborative Seal of Approval from the Massachusetts Homeownership Collaborative administered by the Citizens Housing and Planning Association. Creditor, a person or entity that holds or controls, partially, wholly, indirectly, directly, or in a nominee capacity, a mortgage loan securing a residential property, including, without limitation, an originator, holder, investor, assignee, successor, trust, trustee, nominee holder, Mortgage Electronic Registration System or mortgage servicer, including the Federal National Mortgage Association or the Federal Home Loan Mortgage Corporation. Creditor shall also include any servant, employee or agent of a creditor. Creditor s representative, a person who has the authority to negotiate the terms of and modify a mortgage loan. 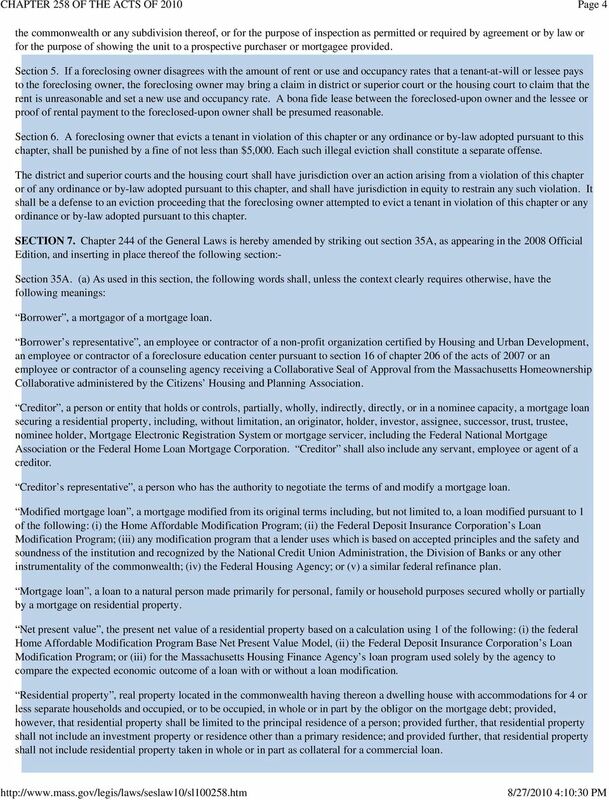 Modified mortgage loan, a mortgage modified from its original terms including, but not limited to, a loan modified pursuant to 1 of the following: (i) the Home Affordable Modification Program; (ii) the Federal Deposit Insurance Corporation s Loan Modification Program; (iii) any modification program that a lender uses which is based on accepted principles and the safety and soundness of the institution and recognized by the National Credit Union Administration, the Division of Banks or any other instrumentality of the commonwealth; (iv) the Federal Housing Agency; or (v) a similar federal refinance plan. Mortgage loan, a loan to a natural person made primarily for personal, family or household purposes secured wholly or partially by a mortgage on residential property. Net present value, the present net value of a residential property based on a calculation using 1 of the following: (i) the federal Home Affordable Modification Program Base Net Present Value Model, (ii) the Federal Deposit Insurance Corporation s Loan Modification Program; or (iii) for the Massachusetts Housing Finance Agency s loan program used solely by the agency to compare the expected economic outcome of a loan with or without a loan modification. Residential property, real property located in the commonwealth having thereon a dwelling house with accommodations for 4 or less separate households and occupied, or to be occupied, in whole or in part by the obligor on the mortgage debt; provided, however, that residential property shall be limited to the principal residence of a person; provided further, that residential property shall not include an investment property or residence other than a primary residence; and provided further, that residential property shall not include residential property taken in whole or in part as collateral for a commercial loan. 7 Page 7 Section 35A. (a) Any mortgagor of residential real property located in the commonwealth, shall have a 90-day right to cure a default of a required payment as provided in such residential mortgage or note secured by such residential real property by full payment of all amounts that are due without acceleration of the maturity of the unpaid balance of such mortgage. The right to cure a default of a required payment shall be granted once during any 5-year period, regardless of the mortgage holder. For the purposes of this section, residential property, shall mean real property located in the commonwealth having thereon a dwelling house with accommodations for 4 or less separate households and occupied, or to be occupied, in whole or in part by the mortgagor; provided, however, that residential property shall be limited to the principal residence of a person; provided further, that residential property shall not include an investment property or residence other than a primary residence; and provided further, that residential property shall not include residential property taken in whole or in part as collateral for a commercial loan. 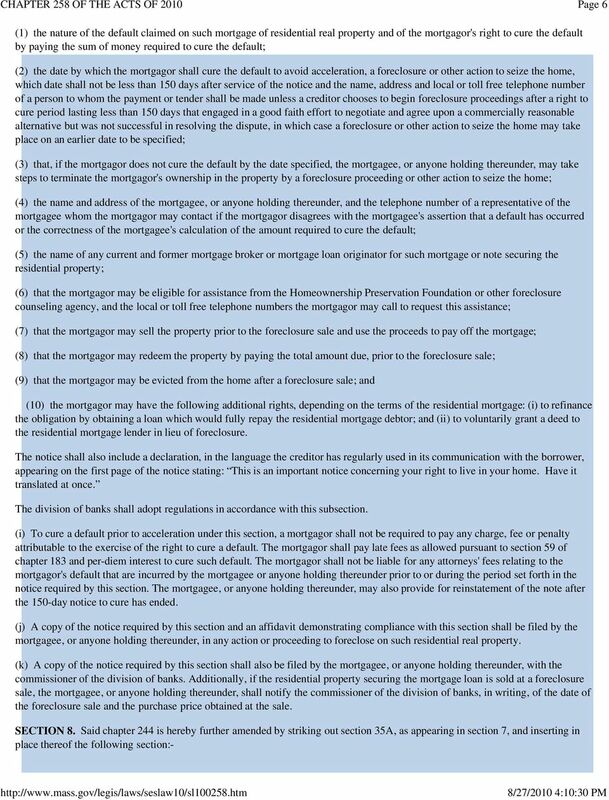 (b) The mortgagee, or anyone holding thereunder, shall not accelerate maturity of the unpaid balance of such mortgage obligation or otherwise enforce the mortgage because of a default consisting of the mortgagor's failure to make any such payment in subsection (a) by any method authorized by this chapter or any other law until at least 90 days after the date a written notice is given by the mortgagee to the mortgagor. Said notice shall be deemed to be delivered to the mortgagor: (i) when delivered by hand to the mortgagor; or (ii) when sent by first class mail and certified mail or similar service by a private carrier to the mortgagor at the mortgagor's address last known to the mortgagee or anyone holding thereunder. 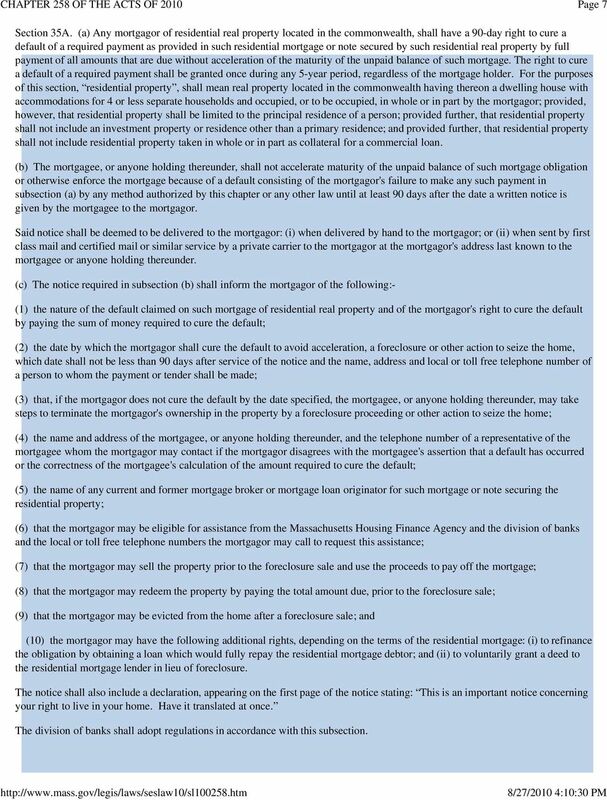 (c) The notice required in subsection (b) shall inform the mortgagor of the following:- (1) the nature of the default claimed on such mortgage of residential real property and of the mortgagor's right to cure the default by paying the sum of money required to cure the default; (2) the date by which the mortgagor shall cure the default to avoid acceleration, a foreclosure or other action to seize the home, which date shall not be less than 90 days after service of the notice and the name, address and local or toll free telephone number of a person to whom the payment or tender shall be made; (3) that, if the mortgagor does not cure the default by the date specified, the mortgagee, or anyone holding thereunder, may take steps to terminate the mortgagor's ownership in the property by a foreclosure proceeding or other action to seize the home; (4) the name and address of the mortgagee, or anyone holding thereunder, and the telephone number of a representative of the mortgagee whom the mortgagor may contact if the mortgagor disagrees with the mortgagee's assertion that a default has occurred or the correctness of the mortgagee's calculation of the amount required to cure the default; (5) the name of any current and former mortgage broker or mortgage loan originator for such mortgage or note securing the residential property; (6) that the mortgagor may be eligible for assistance from the Massachusetts Housing Finance Agency and the division of banks and the local or toll free telephone numbers the mortgagor may call to request this assistance; (7) that the mortgagor may sell the property prior to the foreclosure sale and use the proceeds to pay off the mortgage; (8) that the mortgagor may redeem the property by paying the total amount due, prior to the foreclosure sale; (9) that the mortgagor may be evicted from the home after a foreclosure sale; and (10) the mortgagor may have the following additional rights, depending on the terms of the residential mortgage: (i) to refinance the obligation by obtaining a loan which would fully repay the residential mortgage debtor; and (ii) to voluntarily grant a deed to the residential mortgage lender in lieu of foreclosure. The notice shall also include a declaration, appearing on the first page of the notice stating: This is an important notice concerning your right to live in your home. 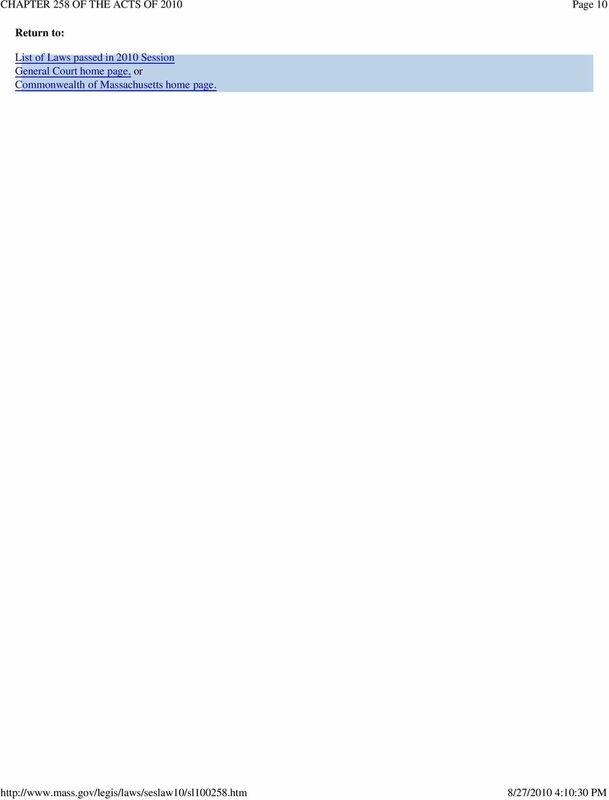 Have it translated at once. The division of banks shall adopt regulations in accordance with this subsection. 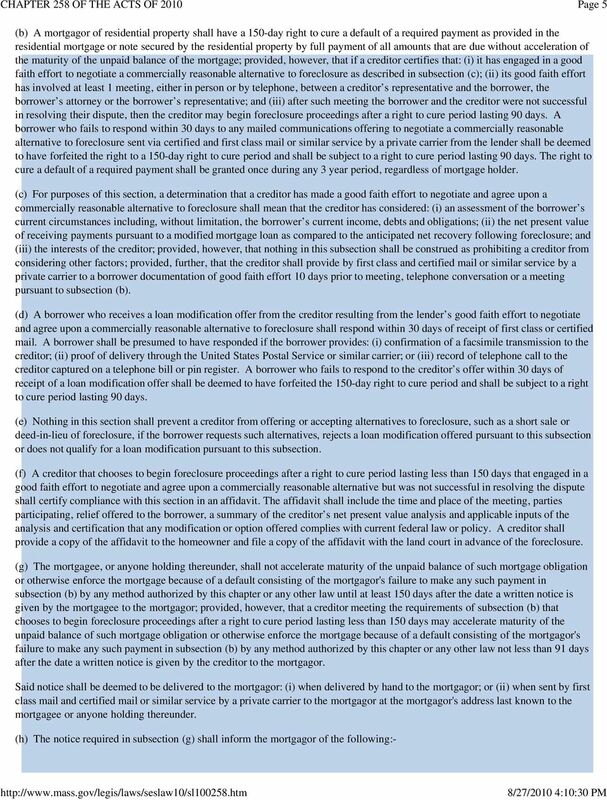 9 Page 9 material omission, knowing the same to be false or to contain a material omission, during or in connection with the mortgage lending process, with the intent that such statement be relied upon by a mortgage lender, borrower or any other party to the mortgage lending process; (3) receives any proceeds or any other funds in connection with a residential mortgage closing, knowing such proceeds or funds were obtained in violation of clause (1) or (2); or (4) files or causes to be filed with a registrar of deeds any document that contains a material statement that is false or a material omission, knowing such document to contain a material statement that is false or a material omission, shall be punished by imprisonment in the state prison for not more than 5 years or by imprisonment in the house of correction for not more than 2 and one-half years or by a fine of not more than $10,000 in the case of a natural person or not more than $100,000 in the case of any other person, or by both such fine and imprisonment. Any person who engages in a pattern of residential mortgage fraud shall be punished by imprisonment in the state prison for not more than 15 years or by a fine of not more than $50,000, in the case of a natural person, or not more than $500,000 in the case of any other person, or by both such fine and imprisonment. 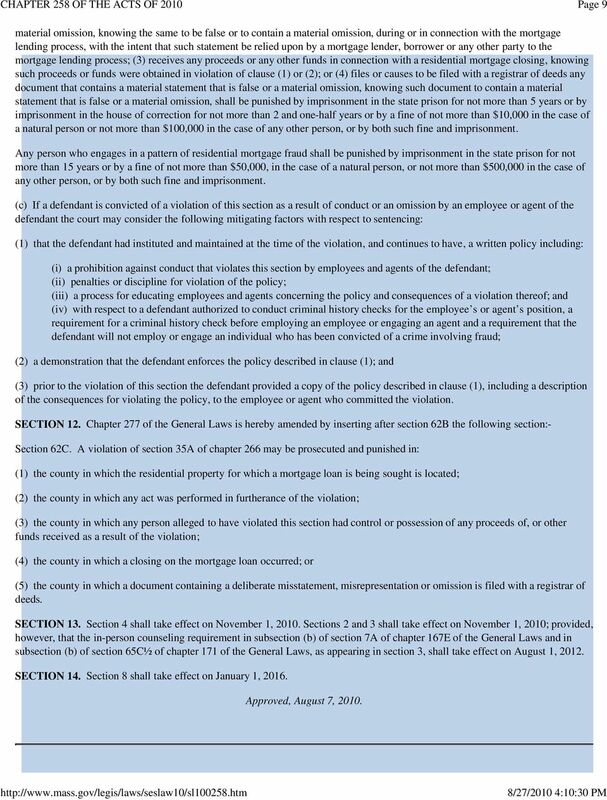 (c) If a defendant is convicted of a violation of this section as a result of conduct or an omission by an employee or agent of the defendant the court may consider the following mitigating factors with respect to sentencing: (1) that the defendant had instituted and maintained at the time of the violation, and continues to have, a written policy including: (i) a prohibition against conduct that violates this section by employees and agents of the defendant; (ii) penalties or discipline for violation of the policy; (iii) a process for educating employees and agents concerning the policy and consequences of a violation thereof; and (iv) with respect to a defendant authorized to conduct criminal history checks for the employee s or agent s position, a requirement for a criminal history check before employing an employee or engaging an agent and a requirement that the defendant will not employ or engage an individual who has been convicted of a crime involving fraud; (2) a demonstration that the defendant enforces the policy described in clause (1); and (3) prior to the violation of this section the defendant provided a copy of the policy described in clause (1), including a description of the consequences for violating the policy, to the employee or agent who committed the violation. SECTION 12. Chapter 277 of the General Laws is hereby amended by inserting after section 62B the following section:- Section 62C. 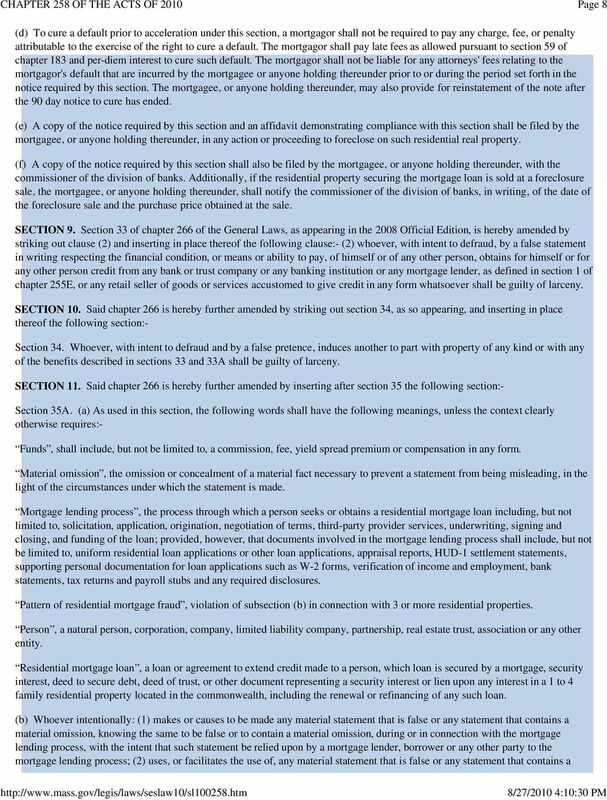 A violation of section 35A of chapter 266 may be prosecuted and punished in: (1) the county in which the residential property for which a mortgage loan is being sought is located; (2) the county in which any act was performed in furtherance of the violation; (3) the county in which any person alleged to have violated this section had control or possession of any proceeds of, or other funds received as a result of the violation; (4) the county in which a closing on the mortgage loan occurred; or (5) the county in which a document containing a deliberate misstatement, misrepresentation or omission is filed with a registrar of deeds. SECTION 13. Section 4 shall take effect on November 1, Sections 2 and 3 shall take effect on November 1, 2010; provided, however, that the in-person counseling requirement in subsection (b) of section 7A of chapter 167E of the General Laws and in subsection (b) of section 65C½ of chapter 171 of the General Laws, as appearing in section 3, shall take effect on August 1, SECTION 14. Section 8 shall take effect on January 1, Approved, August 7, 2010. 10 Page 10 Return to: List of Laws passed in 2010 Session General Court home page, or Commonwealth of Massachusetts home page. ACTS, 1983. - Chap. 527.
sis of salaries for the same or similar types of positions paid by other governments and by private employers with which the commonwealth must compete in securing qualified applicants for such positions. AN ACT RELATING TO PROPERTY; ENACTING THE MORTGAGE FORECLOSURE CONSULTANT FRAUD PREVENTION ACT; IMPOSING PENALTIES. Georgia 2013 Legislation as of March 14, 2013 The Regular 2013 Session for the Georgia General Assembly began in January 2013. Below are updates on the bills of importance to the default servicing community. Contractors Registration Act NJSA 56:8 136 et seq. GENERAL ASSEMBLY OF NORTH CAROLINA SESSION H HOUSE BILL Short Title: Regulate Reverse Mortgages. (Public) Sponsors: Representatives Brubaker, Easterling, Hasty, Ligon, Lineberry, Privette, and Woodard. 360.100 Predatory lending -- Definitions -- Limitations on high-cost home loans -- Conditions -- Penalties. (1) The following definitions apply for the purposes of this section: (a) "High-cost home loan"
IN THE UNITED STATES BANKRUPTCY COURT FOR THE DISTRICT OF. Case No. Senate Bill No. 1609 CHAPTER 202. An act to amend Sections 1632, 1923.2, and 1923.5 of the Civil Code, relating to reverse mortgages.